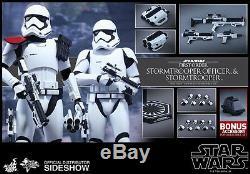 STAR WARS FORCE AWAKENS STORMTROOPER OFFICER 1/6 SCALE FIGURE SET HOT TOYS. This figure is BRAND NEW and FACTORY SEALED! In the upcoming epic blockbuster, Star Wars: The Force Awakens, the First Order has enlisted Stormtroopers equipped with sleek armor and powerful weapons to enforce its will across the galaxy. Sideshow Collectibles and Hot Toys are thrilled to expand the First Order army once again and officially introduce the new sixth scale First Order Stormtrooper Officer and Stormtrooper Collectible Figures Set. The highly-accurate collectible figures are specially crafted based on the image of the First Order Stormtrooper and Stormtrooper Officer in Star Wars: The Force Awakens. 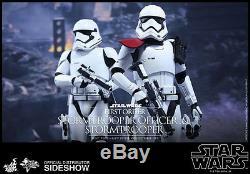 The two troopers are equipped with sleekly designed Stormtrooper armor and helmets and are two different body heights. 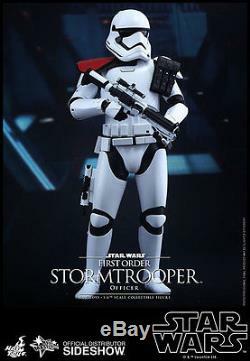 The First Order Stormtrooper Officer stands approximately 30cm tall and is armed with a blaster rifle with extended stock, a pair of articulated binoculars, and a red color pauldron that indicates the rank of Officer while the First Order Stormtrooper stands approximately 29cm tall and is armed with a blaster rifle and blaster pistol. A sixth scale Mouse Droid is also included exclusively in this collectible set! 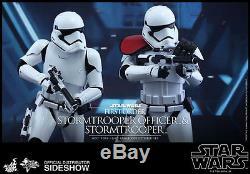 Don't miss the chance to recruit more First Order Stormtroopers to your growing collection today! Stands approximately 11.81 Tall! WHAT'S IN THE BOX? 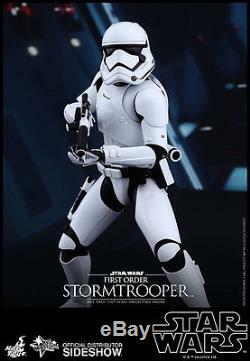 The First Order Stormtrooper Officer Sixth Scale Collectible Figure specially features. Authentic and detailed likeness of First Order Stormtrooper Officer in Star Wars: The Force Awakens. Body with over 30 points of articulation. Nine (9) pieces of interchangeable gloved palms including. One (1) pair of fists. One (1) pair of relaxed palms. One (1) pair of palms for holding weapons. One (1) pair of palms for holding binoculars. One (1) gesturing left palm. One (1) streamline designed First Order Stormtrooper armor. One (1) black shoulder pouch. One (1) belt with pouches. One (1) pair of white boots. One (1) blaster rifle with extended stock. One (1) pair of articulated binoculars. First Order emblem hexagonal figure stand with First Order Stormtrooper nameplate and Star Wars logo. The First Order Stormtrooper Sixth Scale Collectible Figure specially features. Authentic and detailed likeness of First Order Stormtrooper in Star Wars: The Force Awakens. Seven (7) pieces of interchangeable gloved palms including. One (1) sleekly designed First Order Stormtrooper armor. The following additional accessory will be included exclusively for the Collectible Figures Set. 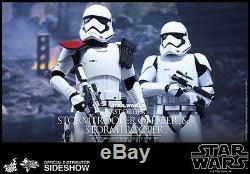 The item "STAR WARS FORCE AWAKENS STORMTROOPER OFFICER 1/6 SCALE FIGURE SET HOT TOYS" is in sale since Monday, August 08, 2016. This item is in the category "Collectibles\Comics\Figurines". The seller is "klfiore" and is located in Mastic, New York. This item can be shipped to United States, to Canada, to United Kingdom, DK, RO, SK, BG, CZ, FI, HU, LV, LT, MT, EE, to Australia, GR, PT, CY, SI, to Japan, to China, SE, KR, ID, to Taiwan, ZA, TH, to Belgium, to France, to Hong Kong, to Ireland, to Netherlands, PL, to Spain, to Italy, to Germany, to Austria, RU, IL, to Mexico, to New Zealand, SG, to Switzerland, NO, SA, UA, AE, QA, KW, BH, HR, MY, BR, CL, CO, CR, DO, PA, TT, GT, SV, HN, JM.